A year before the killing of Hizbul Mujahadeen commander Burhan Wani blew a storm in Kashmir, Qayoom Najar, one of the most experienced militants operating in the Valley, had rattled the security agencies. Qayoom launched a series of attacks on telecom installations in north Kashmir in 2015 including one barely few hundred metres from Srinagar's civil secretariat which houses the office of Jammu and Kashmir chief minister, the cabinet ministers and top civil administration officers. 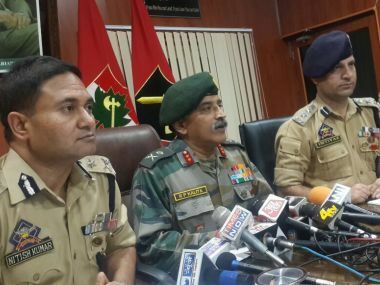 On Tuesday evening General Officer Commanding (GOC) 19 infantry division, Baramulla, Major General RP Kalita, said they received information about the possible infiltration attempt by militants who were planning to carry out a Fidayeen attack along the Line of Control in coming days. In a joint operation, four militants were killed between Sunday and Monday. 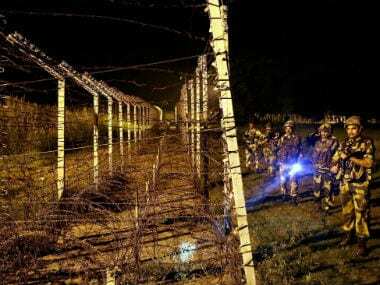 "Troops were already on high alert when they noticed some suspicious movement ahead of the LoC, which resulted in an encounter early Tuesday morning. When the forces zeroed on the site, they found a man surrounded by ammunition and material used to make IEDs," Kalita said. 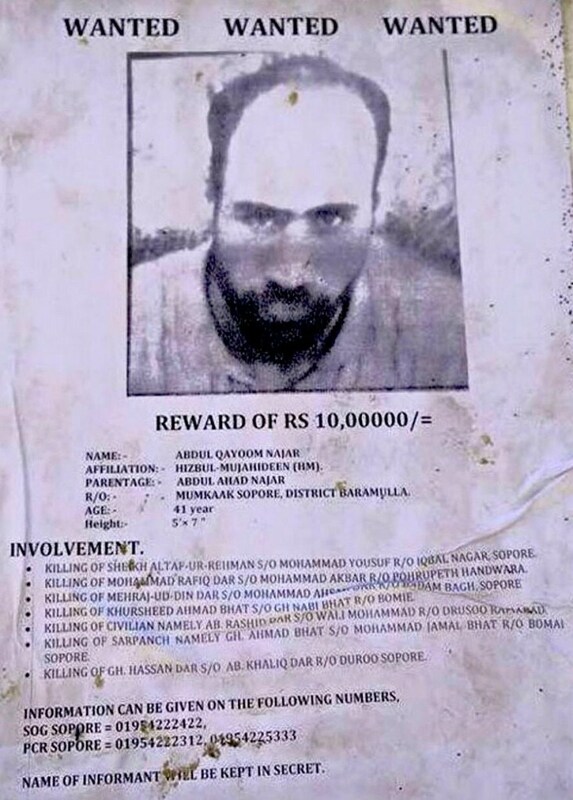 "The terrorist, who was killed in the encounter is Qayoom Najar, a resident of Mumkak Sopore. He was responsible for killing several policemen and civilians," deputy inspector general of police Nitish Kumar said. 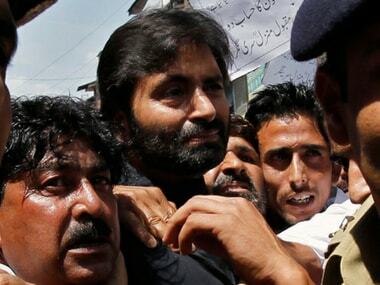 With his death, an important and bloody chapter of the Kashmir insurgency has drawn to a close. "He was one of the smartest militants I have known in my eighteen years of service. He would not even trust his wife, his brother, not even his deputy or seniors," Imtiyaz Hussain, senior superintendent of police Baramulla, who is believed to be one of the top most officers of Jammu and Kashmir Police battling insurgency in Kashmir for years, said. Hussain claims Najar was an IED expert. "Had he been alive and successfully infiltrated, it would have been a big problem for us. Neutralising him would have been very difficult because of his network of ground workers. It is a big achievement for us" Hussain said. Although police claims that Najar was linked with militants since 1999, his family members and friends told Firstpost that he joined militants after him and his family were subjected to harassment at the hands of police over a neighborhood dispute in which Najar was accused of assaulting a female. Najar evaded the forces' dragnet. The rise of Najar as a militant commander accused of killing a Hurriyat activist along with five others, many of them linked to Telecom companies, in the tense summer of 2015 in north Kashmir, remains a mysterious like much of his life. However, he shot to prominence after carrying out a series of attacks against telecom operators in Sopore town, accusing them of spying on militants for security agencies and forcing them to shut down their operations. 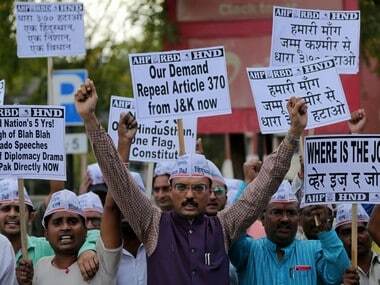 In one instance, he sent one of his associates, Jammu and Kashmir police told Firstpost, into a Vodafone store in Srinagar asking its employees to vacate the store immediately. Within minutes, an explosion at the same showroom sent pieces of glass flying out on to the road. The blast rattled the telecom operators in the Valley and put the security grid into a thinking mode. The outfit that claimed the attacks, Lashkar-e-Islam, (police describes it as a splinter group of Hizbul Mujahideen) which hardly had any presence in the Valley. But what shocked many was the man behind this newly-formed group, who remained a mysterious figure even for his own neighbours — that was Najar. After Hizbul chief Syed Salahuddin blamed Najar for killing innocent people and indulging in character assassination of Hurriyat leaders, he was expelled from the Hizbul. "After the list was rejected, he fell out of favour with Hurriyat, militant leadership, as well as Hizbul leadership, but that was a brief misunderstanding. After that, he was recalled to the base camp in Muzaffarabad in September 2015 where he stayed with Syed Sallahudin. Considering that both of his top commanders in north Kashmir and south Kashmir were dead, Najar was sent to take command of Hizbul which has been almost wiped off from north Kashmir with his (Najar's) killing," SSP Hussain said. Ammunition recovered from Qayoom Najar after his encounter in Uri. Picture procured by Sameer Yasir. A resident of Mumkak Sopore, police says Najar was sixteen when he became a militant after the killing of Hizb commander Abdul Majid Dar. Dar was responsible for initiating talks with New Delhi. "For years he kept a low profile and mostly stayed in Sopore during that time," a police officer posted at Sopore at the time said. Nobody in and around his house remembers him. In an interview with Firstpost in 2015, Najar's father had said that it was a fight between a neighbour and his son which forced him to join militants again in 2005, after police tried to arrest him in the case filed by a women. "He was involved in more then 50 killings. He has killed lot of civilians, policemen and other security forces. He was involved in several incidents involving IED explosions. It is a big achievement for all of us. 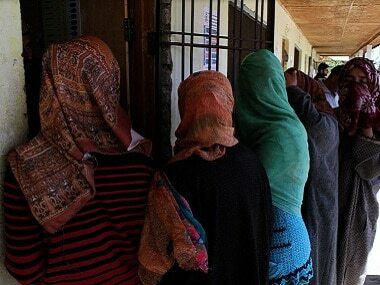 He was already heading a huge network in Sopore, Palhallan and in areas of Bandipora and Baramulla. It is a big relief for us," Hussain said.